What is a Reflex Suppressor? The patented Reflex design of suppressor (or sound moderator) has the expansion chamber sleeved back over the front four to eight inches of the barrel. This reduces the overall length of the suppressed weapon, and improves its balance and handling qualities. Why use a full-bore rifle suppressor? To save your hearing and, if you use a rifle for work, to comply with the UK Health and Safety legislation. Independent tests with a 308 Winchester hunting rifle confirm that Reflex Suppressors do reduce the sound pressure at the shooter's ear to well below the British Health and Safety Executive's "peak action level" of 140 dB. Above this level, HSE regulations require employers to reduce workers' exposure as far as reasonably practicable by means other than ear protectors. This legal requirement also extends to self-employed persons. In practice, depending on the amount of bullet flight noise reflected back to the shooter by trees or fences etc., a full-bore hunting rifle with a good suppressor sounds about the same as a high velocity 22 LR rim-fire rifle. Is a suppressed full-bore rifle "reasonably practicable"? For muzzle-mounted suppressors, the usual single-point mounting system is relatively crude and weak - just a short 1/2" UNF thread and a small shoulder to align the sound moderator with the rifle bore. By contrast, the two-point Reflex mounting system with a thread at the muzzle and a close fitting bush at the rear of the suppressor is very strong and resistant to harsh field use. The suppressor stays in alignment with the bore even if it is accidentally unscrewed a couple of turns. Accuracy and trajectory are not impaired! We usually find that the accuracy of hunting and target rifles is, if anything, slightly improved by the addition of a Reflex Suppressor. 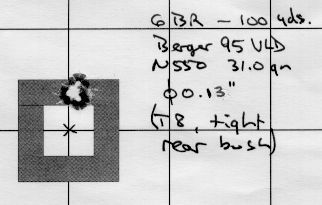 This 1/8 MOA group was fired during load testing with a specialized long range target/varmint rifle fitted with a T8 Scout Reflex Suppressor (see photo below). Shooting without ear defenders, we can listen as well as look and feel for wind changes. The suppressor also cuts recoil by about one third, which makes group-shooting a real pleasure. On this website we provide technical product information, suggested retail prices, hints and tips, guidance on legal and regulatory matters, and links to the Finnish manufacturer's website which includes independent test data and reports. If you have a question which is not answered here, please don't hesitate to phone or fax us. All United Kingdom and overseas trade, retail and government enquiries are welcome.